Climate change will be much worse, much sooner than most people think. A recent study by Dr. James Hansen shows that already, “Extremely Hot Summers” (defined as average summer temperatures that are 3 standard deviations — also called “+3-sigma” — above the mean of the 1951-1980 baseline period) have increased by more than 50 times (5000%) in the past 50 years! This analysis is not based on climate models or predictions. It is based on a simple statistical analysis of actual, measured temperature data from the past 60 years. This increase in Extremely Hot Summers already occurred. The vertical axis is frequency of occurrence (0.1 = 10%) and the horizontal axis is variance (measured in units of standard deviations) of the average summer temperature relative to the baseline mean temperature. 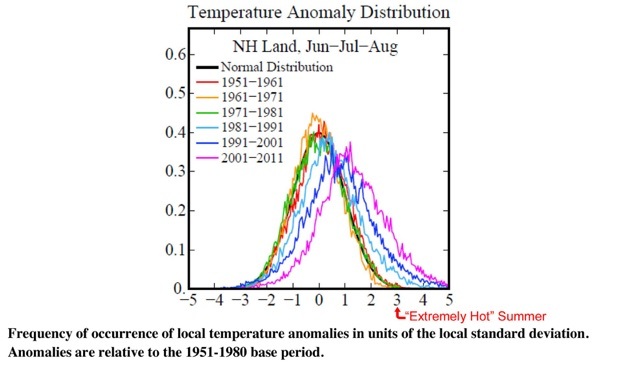 Standard deviations are used instead of actual temperatures because this data is for the entire Northern Hemisphere and the variance of summer temperatures in, say, Anchorage, will likely be different than, say, Miami. Using standard deviations lets us combine temperature measurements from around the globe and analyze them together. For a simple explanation of standard deviations, see here. Blue areas represent “Cold” summers, white represents “Average” summers, and red represents “Hot” summers. The dark red color represents a new class of weather event: “Extremely Hot” summers. In the 1951-1980 baseline period, such Extremely Hot Summers were very rare and covered only 0.1% to 0.2% of the land area on average. In the last decade (2001-2011), Extremely Hot Summers covered about 10% of the land area... a 5000% to 10,000% increase. In simple terms, what we use to think of as cold summers are happening much less often now. What we use to think of hot summers are happening much more often. And extremely hot summers (+3 sigma events), that almost never happened 50 years ago, are happening about 10% of the time now (about as often as cold summers are occurring now!). Of course, we could calculate a new mean summer temperature and reset our expectations for what cold and hot summers are (i.e., the “New Normal”), but that would hide the fact that the climate is changing! And when it comes to extreme heat events, it has already changed dramatically. Because of this 50X increase, when a new +3-sigma event happens in a particular place, we know that that there is a 1 in 50 (2%) chance that it due to natural variability and a 49 in 50 (98%) chance that it is due to manmade climate change. The 2003 European heat wave that killed 70,000 people was a +3-sigma event. So was the recent Russian heat wave that caused food prices to spike and helped trigger the “Arab Spring”. So was the 2011 Texas heat wave that caused over $7 billion in damage. It is these extreme events that cause the most damage and human suffering, as the farmers in the Midwest are now seeing. While Dr. Hansen’s study does not make predictions, a quick look at the results suggests that we should expect even more extreme weather in the future. This is not good news. All of the climate change impacts we have seen so far, including the rapid disappearance of Arctic sea ice in the summer — a phenomenon you could easily observe from the Moon — and the increase in extreme weather have all happened with just a 0.8ºC (1.4ºF) global average increase in temperature. A recent MIT report predicts temperature increases this century due to global warming. The report, Probabilistic Forecast for 21st Century Climate Based on Uncertainties in Emissions (without Policy) and Climate Parameters, is an update to a report done in 2003. 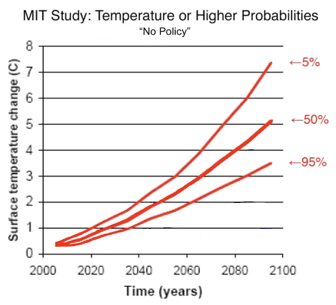 The graph at left from the report shows that in a business-as-usual ("no policy") scenario, there is a 50% chance that the temperature will be 5ºC (9ºF) or more warmer in 2095 and there is a 95% chance that it will be 3.5ºC (6.3ºF) or more warmer in 2095! 1.While the world has only warmed 0.8ºC (1.4ºF) on average, the warming is more pronounced at the poles and this has led to significant warming — and melting — of the permafrost, which is essentially frozen peat. When the permafrost melts, its organic material decays and gives off CO2 or, if the peat decays in water, methane. Methane is 20 to 70 times (depending on the timeframe) more powerful as a greenhouse gas compared to CO2. The permafrost contains about twice as much CO2 as the entire atmosphere holds. Once the permafrost begins giving off greenhouse gases a rate faster than we can decrease our greenhouse gas emissions, its Game Over. Update: A recent study from the National Snow and Ice Data Center in Boulder, Colorado predicts that 190 gigatons of carbon could be released from the permafrost by 2200. For comparison, humans are emitting about 8 gigatons of excess carbon every year. This excess carbon is not included in the temperatures projected in the MIT study above! Furthermore, the NSIDC study used optimistic assumptions such as: all the permafrost emissions would be CO2 and not methane, emissions from underwater permafrost are not included, and the warming from permafrost emissions is not assumed to speed up permafrost melting. The NSIDC study estimates that the permafrost melting could reach a “tipping point” in 15 to 20 years. To stop this tipping point from being reached, action is needed now since it will be impossible to stop once it is reached. 2.There are vast amounts of frozen methane stored in ice structures under the oceans. Much of this frozen methane (called clathrates or hydrates) is deep in the ocean where they won’t be affected much by the surface warming of the ocean caused by global warming. However, some of the clathrates are located in more shallow waters of the Arctic Ocean where the recent dramatic melting of the summer sea ice could cause significant amounts of this frozen methane to be released. In 2008, it was possible to circumnavigate the Arctic Ocean for the first time in recorded history and research ships in the area noticed places where methane was bubbling out of the sea. 3.Global warming is causing vast amounts of trees to die through drought, beetle infestation, or other means. The dead trees give off CO2 when they decay or burn in wildfires — which have dramatically increased in the past decades. When trees decay or burn, they give off CO2 which leads to more warming. 4.The oceans absorb much of the excess CO2 that mankind has released into the atmosphere. But as the ocean warms and as it becomes more acidic (from absorbing our CO2) its ability to absorb CO2 decreases. This effect is already being observed and it means that we need to decrease our emissions faster than it might otherwise seem. The higher acidity also makes it harder for ocean animals to form shells and this is also being observed and is expected to become much worse this century. The oceans can reach a point where they begin releasing CO2 into the atmosphere and that is also Game Over. The time to take dramatic action is right now. We need to put a price on CO2 and other greenhouse gases through a “Cap and Trade” system or, better yet, a tax. We need to ban new coal plants and phase out existing coal plants (which are the worst CO2 offenders). We need to mandate energy efficiency and renewable energy and stop subsidizing fossil fuels. We need to phase out traditional beef production (which creates as much greenhouse warming as cars do!). And we better agree on a serious follow-on to the Kyoto Protocol. Based on my discussions with some climate scientists, I believe that it may already be too late to avoid catastrophe by only reducing greenhouse gas emissions. While we must quickly and dramatically lower our CO2 emissions, we also need to research geo-engineering approaches that attempt to artificially remove CO2 from the atmosphere or reduce warming by blocking some of the sunlight that reaches Earth. Like chemotherapy, some of these approaches have bad side affects, but also like chemotherapy, the alternative to treatment might not be acceptable. We should invest a lot of money now on researching various geo-engineering approaches to see which might work while minimizing the bad side effects. It’s human nature to be optimistic. But things don’t always work out for the better. And in this case, the stakes are too high and scientists tell us that there is no reason to be optimistic if we don’t take serious action right now. For the sake of our children and grandchildren, let’s get moving.